The right atrium receives blood from the body (de-oxygenated blood) and the right ventricle pumps it into the lungs for aeration (removal of carbon dioxide and to add oxygen). The left atrium receives the oxygenated blood from the lungs and the left ventricle pumps it around the body. Blood pressure represents the force (pressure) exerted by blood against the arterial walls during a cardiac cycle (heartbeat) which consists of heart muscle contraction (systole) and heart muscle relaxation (diastole). Systolic blood pressure, the higher of the two pressure measurements, occurs as the heart muscles contract pumping blood into the aorta. Heart muscles then relax allowing the heart to refill with blood and the lowest pressure reached represents the diastolic blood pressure. Normal systolic blood pressure in an adult varies between 110 and 140 mm Hg, and diastolic pressure varies between 60 and 90 mm Hg. The resting heart rate for the average person is between 70 and 90 beats per minute (bpm). The term tachycardia is applied to a rapid heart rate (over 100 bpm) and the term bradycardia indicates a slow heart rate (less than 50 bpm). Endurance athletes may have a resting heart rate of less than 50 bpm due to having an enlarged heart as a result of their training regime. This is the amount of blood pumped from your heart and is calculated by multiplying heart rate by stroke volume (the amount of blood ejected by the heart in each beat). An endurance athlete will have a lower resting heart rate and a larger stroke volume than a non-athlete. The cardiac output for an endurance athlete is approx. 35 litres while that for the non-athlete is 22 litres. Starling's law of the heart states that the stroke volume of the heart increases in response to an increase in the volume of blood filling the heart. A paper by Solaro (2007) examines the mechanism of Starling's Law. Research by Millar-Craig et al. (1978) found that blood pressure was lowest at 3-am and began to rise again during the early hours of the morning before waking. 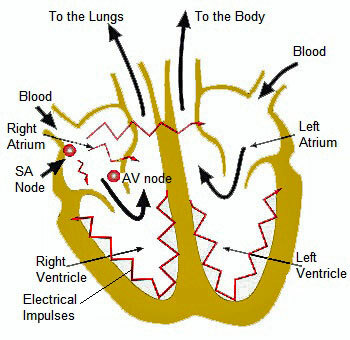 The "SA Node" (see diagram) is the heart's pacemaker which sends out an electrical signal causing the Atrium to contract and to pump blood into the ventricle. The electrical impulse is conducted to the ventricle via the "AV Node" causing the muscle to contract and to pump blood out. Oxygen-enriched blood from the lungs enters the left atrium and the left ventricle pumps it out to the body. Blood from the body, which contains carbon dioxide (CO2), enters the right atrium and the right ventricle then pumps the blood out to the lungs to have the CO2 removed and replenished with oxygen. The diagram opposite reflects a simplified normal heart electrocardiogram (ECG). The "P Wave" represents the electrical activity of the SA Node and atrium. 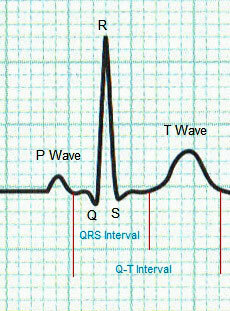 The "QRS Interval" represents the electrical activity of the ventricle. The "T Wave" represents the ventricle relaxing ready for the next electrical impulse - known as repolarisation. "Q-T Interval" is the measurement of repolarisation. SHIN, K. et al. (1997) Autonomic differences between athletes and nonathletes: spectral analysis approach. Medicine and science in sports and exercise, 29 (11), p. 1482-1490. Trialists' Collaboration (2003) Effects of different blood-pressure-lowering regimens on major cardiovascular events: results of prospectively-designed overviews of randomised trials. Lancet, 362 (9395), p. 1527-1535.